(Bloomberg) -- Walt Disney Co.’s “Captain Marvel” is the most successful female-led superhero film of all time, topping $1 billion in box-office revenue on Wednesday. (“Wonder Woman,” the previous record holder, amassed $821.8 million.) 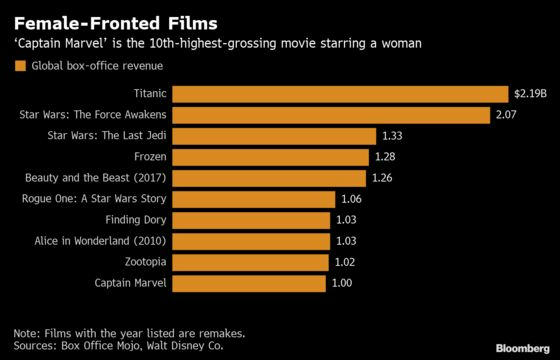 But in terms of overall movies with a woman as a protagonist, “Captain Marvel” only just inched into the Top 10 of a Disney-dominated list: Every movie other than “Titanic” was made by the company.